Three months after her retirement, former Supreme Court President can no longer publish decisions. Former Supreme Court President Dorit Beinisch can no longer give decisions as a judge, as of today. She retired three months ago but until today could still pronounce judgment in cases that were undecided. Beinisch, who followed her predecessor Aharon Barak in adopting an ultra-leftist and confrontationally activist line, kept on giving controversial decisions until the very end of her term and beyond it. 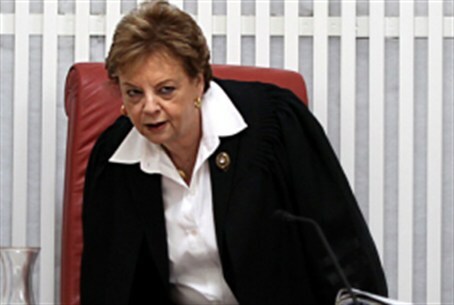 Shortly before her retirement, Beinisch decided that the Tal Law regulating the enlistment of haredim to the IDF is unconstitutional. This threw the coalition into disarray and nearly brought about early elections. After her retirement, she made another decision in which she ruled that Arab communities suffered unfair discrimination in the allocation of tax benefits. Deputy Supreme Court Judge Eliezer Rivlin is also retiring Monday. Rivlin was considered close to Beinisch. He will be replaced by Prof. Dafna Barak-Erez, who is considered ultra-leftist as well. Barak-Erez is also a militant feminist and has published a collection of translated articles by militant feminist jurist Catherine Mackinnon.